We are a Bosch Car Service Centre with state of the art diagnostic equipment and the might of Bosch Service behind our operation. We offer servicing formats to suit both your vehicle and your pocket. We provide 3 levels of Bosch standard servicing, Bronze, Silver or Gold ( See details here ) or the manufacturer's service schedule, so you can decide which is most appropriate for your car. Just call us now on 01462 437142 with your registration number and we will be pleased to quote you an all-in service price. If your vehicle is within the manufacturer's warranty period we will use OEM - original materials, to maintain the warranty; outside warranty we can help to reduce your costs by using high specification, lower cost alternatives, should you so wish. Everyone recognises that a well maintained vehicle can minimise its carbon footprint, so if you must drive and you want to be as green as you can, keep your car properly maintained by having it regularly (annually) serviced with us. We use Premium Quality Motor oils for refreshing your engine at a service requiring oil and filter change. Our waste oil and contaminated products are ecologically contained and dealt with to minimise pollution to our planet. We can Collect & Deliver locally, if you wish, or provide use of a Courtesy Car whilst your vehicle is having its service ( you drive on our insurance and we just expect you to replace the fuel you use). 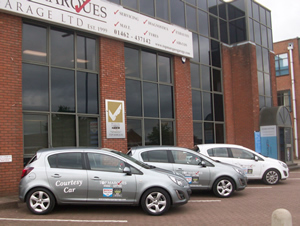 For your comfort & convenience our Courtesy Cars are 5 door Vauxhall Corsas with ISOFIX kiddie seat fixings in the rear. There is no additional charge for the courtesy car, all we ask is that you replenish the fuel you use. If you live in the Hitchin, Letchworth, Baldock or Stevenage area then next time your Ford, Seat, Volkswagen, Skoda, Hyundai, Honda, Toyota, Peugeot, Citroen, Renault, BMW, Volvo, Saab, Vauxhall or Kia needs an MoT or a service, why not try our local, family owned & run garage. We are sure you will be delighted enough to recommend us to your friends.